Background and objectives: Serum creatinine concentration at the time of nephrology consultation is not necessarily indicative of the severity of acute kidney injury (AKI). Although urine microscopy is useful to differentiate AKI, its role in predicting adverse clinical outcomes has not been well described. Design, setting, participants, & measurements: The relationship between urine microscopy findings at the time of nephrology consultation for AKI and clinical outcomes was evaluated prospectively. A urinary sediment scoring system was created on the basis of the number of renal tubular epithelial cells and granular casts. The primary outcome was worsening of AKI (progressing to higher AKI Network stage, dialysis, or death) during hospitalization. Results: Of 249 patients consulted for AKI, 197 had acute tubular necrosis or prerenal AKI and were included in the analysis. At consultation, 80 (40%) had stage 1, 53 (27%) had stage 2, and 66 (33%) had stage 3 AKI. The urinary sediment combined scores were lowest in those with stage 1 and highest in stage 3 AKI. Seventy-nine patients (40%) experienced worsening of AKI from the time of consultation. The urinary scoring system was significantly associated with increased risk of worsening AKI (adjusted relative risk: 7.3; 95% confidence interval: 4.5 to 9.7 for worsening with score of ≥3 versus score of 0) and was more predictive than AKI Network stage at the time of consultation. Conclusions: The urinary sediment score may be a useful tool to predict worsening of AKI due to either acute tubular necrosis or prerenal AKI during hospitalization. Currently, diagnosis of acute kidney injury (AKI) is based on serum creatinine concentration and urine output. The Acute Kidney Injury Network (AKIN) definition is based on these two parameters and uses various cutoffs to define three distinct AKI stages (1). Urine microscopy and biochemistry are complementary to these diagnostic parameters and provide information that facilitates the differentiation of AKI into traditional categories, including prerenal AKI and acute tubular necrosis (ATN), the most common causes of hospital-acquired AKI (2–4). Urinary microscopy in patients with ATN classically is described as containing renal tubular epithelial (RTE) cells, RTE cell casts, granular casts, or mixed cellular casts, whereas sediment in patients with prerenal AKI usually is bland or contains occasional hyaline casts (5–9). In fact, we recently demonstrated that urine microscopy at the time of nephrology consultation, on the basis of the number of RTE cells and granular casts (Table 1), is very helpful in differentiating these two forms of AKI (10). We believe this is important because both prognosis and therapies for prerenal AKI and ATN differ substantially, making early clinical differentiation fundamental to AKI management. A major area of intense investigation in the setting of AKI is the ability to predict a more severe AKI course, as measured by higher serum creatinine concentration (or AKIN stage) during hospitalization, requirement for renal replacement therapy (RRT), and death. The AKI community is in search of biomarkers that are readily available, inexpensive, and reasonably accurate in predicting these important clinical outcomes. Currently, several serum and urinary biomarkers are being evaluated for their ability to predict these outcomes in patients with AKI, some of which show promise (11,12). 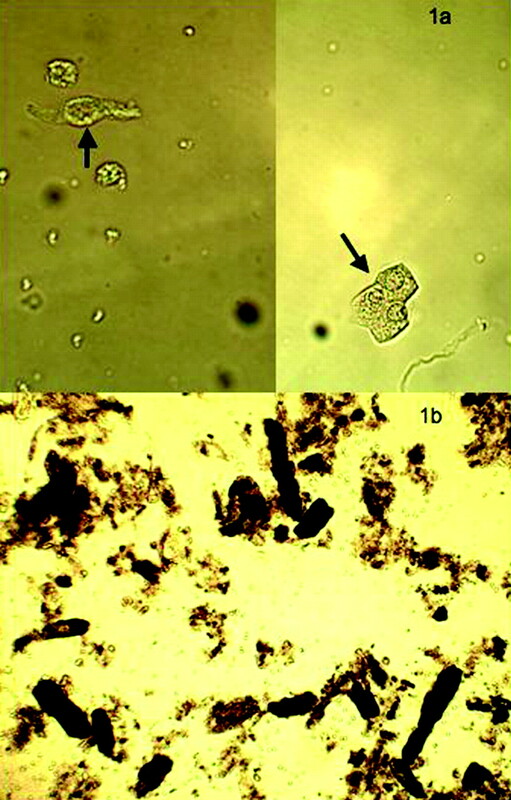 The aims of the present study are to examine the following aspects of the urine microscopy: (1) whether urine sediment findings in the two most common forms of AKI in hospitalized patients, prerenal AKI and ATN, are associated with AKIN stage at the time of consultation for AKI; and (2) whether urine sediment findings in these patients are useful in predicting severity of AKI during hospitalization. In this prospective study, fresh urine samples were obtained from 249 consecutive patients who were seen for diagnosis of AKI by the nephrology consult service at Yale New Haven Hospital between July 2008 and March 2009. AKI was defined as per the AKIN definition (either a 0.3 mg/dl or 50% increase in serum creatinine concentration above baseline) and staged accordingly. The consultant nephrologist was asked to assess the probable etiology of AKI after clinical assessment of the patient but before urine microscopy (preurine microscopy diagnosis) and the degree of diagnostic certainty of the cause of AKI (0% to 20%, 21% to 50%, 51% to 80%, 81% to 100%). The consultants were asked to provide a diagnosis of AKI that fit into one of three categories: (1) ATN, (2) prerenal AKI, or (3) other. The consultants were instructed to use all available clinical data to make these presumptive diagnoses, including clinical scenario, temporal course of serum creatinine concentration, and response to treatment including intravenous fluids, discontinuation of or addition of diuretics, vasopressors, and use of steroids. At the time of initial consultation, fresh urines were obtained from the patients and were examined within 1 hour after voiding. The consultants were trained in all aspects of urine microscopy before their participation in the study (see previous publication by Perazella et al. (10) for details of urine preparation, urine sediment definitions, and physician training in appropriate urine sediment examination). Clinicians were documented as certified after didactic and hands-on training on urine microscopy and correct identification of sediment findings (cells and casts) on over 50 urine sediment slides (PowerPoint). We also collected data on the following patient characteristics: age, gender, race, diabetes status, and history of hypertension, peripheral vascular disease (PVD), congestive heart failure (CHF), coronary artery disease (CAD), and chronic kidney disease (CKD, by National Kidney Foundation stage). Pertinent laboratory data collected included baseline GFR, laboratory reported urine dipstick analysis, serum creatinine concentration (baseline, time of consultation, and peak concentration during hospitalization). Requirement for RRT (temporary and permanent) or death during hospitalization was also recorded. These findings were recorded on a data collection form provided to all consultants on the nephrology service and maintained in a secure location. A urinary sediment scoring system on the basis of the number of RTE cells and granular casts was created (10). As seen in Table 1, the score was calculated by adding points assigned to the number of RTE cells and/or granular casts present in the urine sediment at the time of nephrology consultation. To assess the level of agreement between scores by nephrology consultants, we developed a survey using digital photomicrographs from 16 random high-powered fields (HPFs) to count RTE cells (Figure 1a) and eight random digital photomicrographs of low-powered fields (LPFs) to count granular casts (Figure 1b). Consultants who participated in the study individually reviewed the images and were blinded to all other consultants' responses. (a) High-powered view of urinary RTE cells. (b) Low-powered view of urinary granular casts. Magnifications: ×400 in a; ×100 in b. The arrows point to RTE cells. The primary outcome was the composite outcome of “worsened AKI,” which was defined by an increase in AKIN stage (from the time of consultation), need for in-hospital dialysis, or in-hospital death. AKIN stages were determined by serum creatinine criteria only (not urine output). For the statistical analyses, we only included patients with ATN and prerenal AKI. Categorical variables were compared via χ2 analyses, and continuous variables were compared with t tests. Logistic regression models incorporating the variables that were significant from univariate analyses (Table 2) were created to assess the risk of worsening AKI associated with the urinary sediment score. A backward selection technique was used to create the final model. The area under the receiver-operative curve (AUC) was calculated using the C-statistic. Odds ratios were converted to relative risks via the method proposed by Zhang and Yu (13), because the incidence of the outcome was >10%. Kappa statistics were calculated to assess interobserver variability between urinary sediment scores using the online Java applet program by Randolph (14). All other statistical analyses were performed with SAS (version 9.1; SAS Institute, Cary, NC). The protocol was approved by the Human Investigation Committee at Yale University. Of 249 patients seen in consultation by the nephrology service between July 2008 and March 2009, 197 ultimately were diagnosed with prerenal AKI or ATN (134 had ATN and 63 had prerenal AKI). The other 52 patients had other diagnoses responsible for AKI. Included in this group were the following: glomerulonephritis/vasculitis (n = 16), obstructive nephropathy (n = 11), acute interstitial nephritis (n = 9), hepatorenal syndrome (n = 6), thrombotic microangiopathy (n = 3), preeclampsia (n = 3), and other (n = 4). These patients were not included in the final analysis. At the time of renal consultation, 78 patients had AKIN stage 1 AKI (58% ATN), 53 had stage 2 AKI (60% ATN), and 66 had stage 3 AKI (85% ATN). A total of 79 (40%) of these patients experienced the composite endpoint of “worsened AKI.” Thirty-six patients died (ATN: 33 (25%) of 134; prerenal: 3 (5%) of 63). Patients who worsened were more likely to have a higher serum creatinine at the time of consultation, a larger change in serum creatinine from baseline, proteinuria, and were less likely to have a history of hypertension (Table 2). There were no differences in the proportions between those who worsened and those who did not by male gender or a history of diabetes, CKD, PVD, CHF, CAD, or oliguria at the time of consultation. The number of granular casts per LPF and the number of RTE cells per HPF were both associated with AKI stage at the time of consultation (P = 0.01 and 0.03, respectively) and with worsening AKI (P < 0.001 and 0.015, respectively). Thus, the relationships between the urinary sediment score (Table 1) and AKIN stage and worsening AKI were formally examined. The urinary sediment score was associated with a higher AKIN stage of AKI (Table 3). Because of the small number of patients with a urinary sediment score of 4 (n = 5), they were combined with score 3 and analyzed as ≥3. The majority of patients with stage 1 AKI had a urinary sediment score of 0 or 1, whereas the majority of patients with stage 3 AKI had a urinary sediment score of 2 or ≥3. Furthermore, the urinary sediment score was associated with a higher risk of worsening AKI in a dose-dependent manner (Table 3; Figure 2a), whereas AKIN stage was not predictive of worsening AKI (Figure 2b). The incidence of worsening AKI was 9.4%, 36.2%, 54.1%, and 66.7% in those with urine sediment scores of 0, 1, 2, and ≥3, respectively (P < 0.001 for trend). The relative risk for worsening AKI was 7.3 in those with a urinary sediment score of ≥3 compared with a score of 0. The urinary sediment score provided an AUC for worsening AKI of 0.75. The AUC improved slightly to 0.82 when other clinical predictors were considered with the score (Table 4). (a) Patient outcomes by urinary sediment score. (b) Patient outcomes by AKIN stage. In sensitivity analyses, we examined the relationship between the urinary sediment score and clinical outcomes (worsened AKIN stage or dialysis, dialysis alone, dialysis or death). The associations between the urinary sediment score and all outcomes (composite and individual AKI outcomes) were statistically significant (Figure 3). Analysis of patients who met the “death alone” endpoint (n = 23) revealed the following: (1) recovered to baseline renal function at time of death (n = 0); (2) started to recover from AKI with declining serum Cr at time of death (n = 2); (3) persistent AKI with serum creatinine not going up or down at time of death (n = 2); and (4) worsening renal function with rising serum Cr at the time of death (n = 19). The urine sediment score also retained its association with worsening AKI in patients who had a clinically uncertain diagnosis (0% to 80%) at the time of consultation (Table 5). Finally, stratification of our cohort by CKD status did not demonstrate effect modification by CKD on the dose-dependent relationship between the urine sediment score and AKI worsening (data not shown). Sensitivity analyses: urine sediment score and outcomes. A post hoc, scientific survey of seven consultants who performed the urine sediment assessments revealed that the percent of overall agreement and free-marginal kappa score were, respectively, 65% and 0.47 for assessing RTE cells per HPF and 80% and 0.73 for assessing granular casts per LPF. Our results demonstrate that a urinary sediment score, on the basis of a composite of granular casts and RTE cells, is associated with the AKIN stages of AKI and with the risk of worsening AKI, as defined by worsened AKIN stage, dialysis, or death, in a dose-dependent manner. As such, the urinary sediment score serves as an excellent proxy for the severity of AKI, and it is a better predictor of AKI that worsens during hospitalization than the change in serum creatinine from baseline or oliguria at the time of renal consultation. Furthermore, the components of the urine sediment score are straightforward and exhibit significant reliability and agreement between nephrology consultants, as indicted by positive kappa scores greater than 0.4. Importantly, the urine sediment score was predictive of worsening of patients who had an unclear diagnosis at the time of consultation (diagnostic certainty 0% to 80%). One can speculate that increased numbers of RTE cells and granular casts (in a graded fashion) reflect cell death and apoptosis that would be associated with more severe renal tubular injury, and thus worse outcomes. Thus, urinary microscopy should remain as a standard practice and valuable tool in the diagnosis and assessment of AKI. Although early diagnosis of AKI is a priority to perhaps allow early interventions to reverse or modify the clinical course, it is also important for the clinician to obtain prognostic information at the time of consultation for established AKI. The ability to risk stratify AKI at this time point will allow early planning of patient management, including such interventions as conservative fluid management to avoid fluid overload and pulmonary edema, appropriate early management of electrolyte and acid-base disturbances, and timely vascular access placement for RRT. The clinician will be able to more confidently predict the probable clinical scenario for the consultant, nursing staff, and entire health care team. Finally, the nephrologist may also be able to more accurately provide information about the likely course of AKI for the patient and family. Several novel urinary biomarkers that are not yet clinically available have been found to be elevated in patients with ATN and not prerenal AKI (15–17). However, when these biomarkers have been examined for their prognostic abilities in AKI, their performance for this purpose has been conflicting (11). Although some studies demonstrate that some novel urinary biomarkers (urinary cystatin C, α-1 microglobulin, N-acetyl-β-d-glucosaminidase, and retinol-binding protein) have fairly strong ability to predict severe AKI (AUC: 0.81 to 0.92), (18,19) other studies of many biomarkers, including some of those that have been most widely studied for the diagnosis of AKI (neutrophil gelatinase-associated lipocalin, IL-18, kidney injury molecule 1), have shown widely disparate results of their ability to predict need for dialysis, length of AKI, or in-hospital death across studies (20–24). Some of these biomarkers have AUCs <0.7 for prediction of severe AKI (19,21). The urine sediment score not only discriminates between ATN and prerenal AKI, but with regard to prognosis of AKI, it performed similarly well or even better than many “novel” biomarkers, because it provided an AUC for worsening AKI of 0.75. Thus, this readily available, inexpensive, and easy to perform test may be able to help the nephrology community both clinically and in future AKI research. Perhaps the combination of urine sediment plus novel biomarkers will help improve the precision in prognosticating outcomes of AKI. An ideal prognostic test should have many characteristics. It should be easy to perform, readily available, inexpensive, provide discrimination, and predict clinically meaningful outcomes before they occur. Urine microscopy fulfills all of these criteria. Furthermore, there is a trend toward automated microscopy at several hospitals in the United States (25,26). Although general clinicians depend on these automated systems, the performance of automated microscopy has not been thoroughly studied. More of a cause for concern is the poor performance of these systems in correctly identifying the various urinary casts. Therefore, until automated microscopy is validated, provider-performed urinary microscopy should remain the standard of care for patients with AKI. There are many limitations to the study. First, urine microscopy was not necessarily performed on the first day that the patient met the AKIN criteria for AKI. Instead, microscopy was performed at the time of renal consultation. Thus, there likely is “spectrum bias” in that only more severe cases of AKI were seen in consultation and enrolled into this study. Thus, if all patients with AKI had urine microscopy, the urinary sediment score may not have performed as well and the incidence of worsened AKI may have been much lower. On the other hand, this study reflects “real-world” consultative medicine and application of this diagnostic and prognostic test. Thus, the generalizability is better than if urine microscopy was performed on all patients with AKI by laboratory criteria. Second, our urine scoring system can only be applied to prerenal AKI and ATN and not other forms of hospitalized AKI (e.g., obstruction, glomerulonephritis, etc.). Third, the nephrologists who performed the urine microscopy assessment were not blinded to the patient's clinical status. Thus, there is the potential for observer bias, in that the readers may have knowingly or unknowingly overcounted or undercounted the number of casts and RTE cells on the basis of the patient's clinical status and propensity to have ATN (versus prerenal AKI and other types of AKI). This potential study flaw is somewhat countered by the fact that in the setting of diagnostic uncertainty, urine sediment findings maintain their ability to discriminate causes of AKI and are associated with worsening of kidney function. In addition, the clinicians performing urine microscopy were not aware of the study objective to examine the ability of urine microscopy to predict AKI severity, reducing potential bias further. Future studies of urine microscopy should involve blinding and/or digital photographs of the sediment that are reviewed by an independent nephrologist. Fourth, as mentioned above, several novel urinary biomarkers of AKI are currently being investigated for the diagnosis and risk stratification of AKI. Unfortunately, we did not collect urine for novel biomarker assays in this study. Future studies, in particular a multicenter study, should be undertaken to validate the findings in this study and compare currently available biomarkers (e.g., urine microscopy) versus novel biomarkers for risk stratification of AKI. In conclusion, the urinary sediment score is associated with the AKIN stages of AKI at the time of renal consultation and may be a useful tool to predict worsening of AKI during hospitalization. Urinary microscopy should be performed on patients with AKI, and studies that rigorously determine its value for risk stratification in AKI should be performed. S.G.C. is funded by the career development grant K23DK08013 from the National Institutes of Health. C.R.P. is supported by the AKI grants R01 HL085757 and U01-DK082185 from the National Institutes of Health. Author Contributions: Study concept and design: M.A.P., S.G.C., and C.R.P. ; analysis and interpretation of data: M.A.P., S.G.C., U.I., I.E.H., and C.R.P. ; drafting of the manuscript: M.A.P., S.G.C., and C.R.P. ; critical revision of the manuscript for important intellectual content: M.A.P., S.G.C., I.E.H., and C.R.P. ; statistical analysis: S.G.C., I.E.H., and U.I. Obtained funding: none. Administrative, technical, and material support: M.K. Study supervision: M.A.P.